Drums for Kids is a fun, easy course that teaches children to play drumset faster than ever before. Popular songs will keep kids motivated, while the simple, easy-to-read page layouts ensure their attention remains focused on one concept at a time. The method can be used in combination with a drum teacher or parent. Demonstration tracks are included online for download or streaming. Songs include: Another One Bites the Dust • Crazy Train • Free Fallin' • Living After Midnight • Old Time Rock & Roll • Stir It Up • When the Levee Breaks • and more. This concise title is one of the most user-friendly how-tos for beginners to hit the market lately. 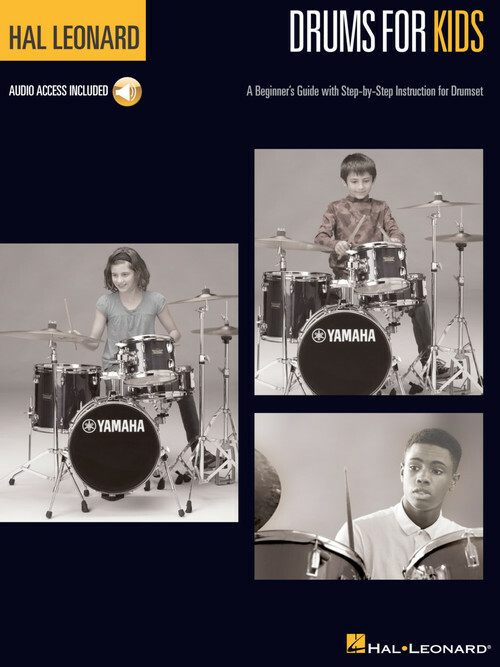 In this thirty-two-page method book, author Scott Schroedl puts thoughtful consideration into the tools that a novice of any age needs in developing basic drumset skills. Simple, straightforward descriptions and illustrations of setting up the kit, holding the sticks, and reading drum notation begin the journey. Sections on developing quarter- and 8th-note reading skills on the snare, adding rests, and then building ear training (with the aid of well-recorded online play-along tracks) make it easy to track your progress. Once bass drum training begins, classic rock play-alongs invite the musical aspect of development. Schroedl cleverly introduces each piece of the kit (cymbals, toms, etc.) via well-known tunes that complement each addition until total drumming bliss is achieved. “Less is more” certainly applies to this well-done package.